1.5 Why Do Scientists Publish Papers? 1.6 What is a Good Manuscript? Chapter 5 What is a Thesis or Dissertation? 7.1 What is a Research Project? Dr. Omale James received his Ph. D in Biochemical Toxicology, from Michael Okpara University of Agriculture, Umudike, Abia State, Nigeria during the period of 2009. He obtained B. Sc and M. Sc degree in Biochemistry from U.D.U.S and University of Ibadan, Nigeria respectively. Currently he works as a Lecturer in the Department of Biochemistry, Kogi State University, Anyigba, an Associate Professor of Biochemistry. He is currently the Head of Department of Biochemistry and Deputy Dean, School of Postgraduate Studies, Kogi State University, Anyigba. He serves as an editorial member of several reputed journals like International Journal of Malaria Research and Review, International Journal of Pharmaceutical and Biological Research, International Journal of Biotechnology and Allied Fields, Journal of Applied Pharmaceutical Sciences, International Research Journal of Applied Life Sciences, International Journal of Pharmaceutical Sciences Review and an expert reviewer for Journal of Integrative Medicine, Annual Research & Review in Biology, Journal of Medicine and Medical Sciences etc. He has authored over 58 journal articles and he is a member of Nigerian Society of Biochemistry and Molecular Biology, Nigerian Society of Experimental Biology and Society for Medicinal Plant and Natural Products Research (GA). He has attended several conferences and workshops in Nigeria, the United Kingdom and other countries in Europe. 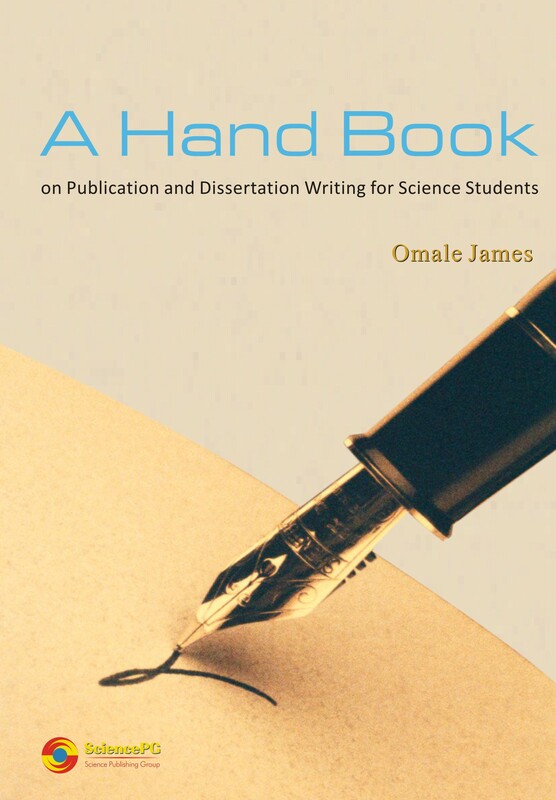 The book “A Hand Book on Publication and Dissertation Writing for Science Students” was written primarily for students, who struggle to write their undergraduate and postgraduate thesis/dissertation with difficulties and who wish to publish their research work after graduation. The author tried to simplify the approaches involved in writing theses by organizing them in simple order, enumerating the common mistakes in thesis and publication writing. These general guidelines could help a science student to adapt easily to writing a world class journal paper and an award winning dissertation. The book explores various aspects of publication writing from title to references and from submission to revision, how to write a good research proposal and dissertation. Any science student having gone through this compilation will be fully equipped to face the challenges of dissertation and publication writing and builds his or her academic career on the foundation. Undergraduate and Postgraduate Students of Biochemistry, Biology, Chemistry, Microbiology, and Agriculture will find this book useful in the course of their University education.